A quick look at that rankings table shows that blue team has almost all the pros, tbh looks like you guys let the round go on for a while so you could get more kills on red team. Not much of an achievement then imo *shrugs*. Yeah, a noob is worth 7 points, 110 kills times 7 is 770 points, you had 820. Seems like you maybe kill-farmed, or just waited for noobs to come to you for a while. so I digged and digged (unprotected) ... and he know later where to find me ... haha just with the wooden sword, but as my Daughter like to play there I join and test "roles"
Esskeetit wrote: I FINALLY did it!! Beat it all...I dare you. PS: Esskeetit is VERY sorry if this is not the record and/if he's being a bit too cocky. He is just too happy at the moment and is celebrating for his efforts. My CTF maps: Karsthafen, River valley, Tunnel, Plain battle, Forest map. I play in capture the flag server. Not to mention Gpvp, who had half the kills, ended up with twice the score xD. Stix wrote: Not to mention Gpvp, who had half the kills, ended up with twice the score xD. Combat logging, i.e. leaving the game during fight to avoid being killed and joining again immediately afterwards, is strongly discouraged and will be punished appropriately if done repeatedly. my (Thomas) daughter Cookking (Celine) had seen this also a bit, and also told me that your there, but I had no time to join. Yes I have seen that also. I tried twice the server, I thought there was a HUB leading to CTF Maps. So, I arrived in plain combat and didn't know what to do. I was looking specially a player on the server, for I have been told SHE plays often here. LadyPyle does play here often now. Also if i see you on ill show you what to-do (whats your IGN?). Celine so you Thomas-S, turned around at PC and looking me, Why so much Thomas ? I need to check her PC, yesterday she saw a gamer able to open enemy door, position and name should then be available. Festus1965 wrote: Celine so you Thomas-S, turned around at PC and looking me, Why so much Thomas ? You would need to ask the host (rubenwardy) to look at HUGE logs for one report. Besides, I don't think the logs record the position of a character opening a door. As for combat logging, thank goodness thats a rule. It is super annoying when people leave (spike, mainly) and frustrating. Also, there are way to many false positives for the report. Sometimes, textures can mix up, or the enemy opened the door. Either way, you probably couldn't base a legitimate report on that. 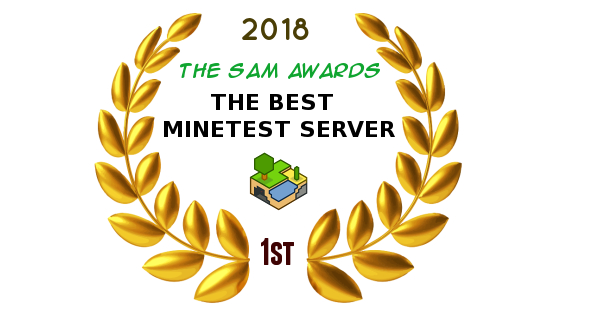 Your server is the best 2018 server thanks to the votes of the community! 11:00 - 11:10 (-6 to your time) on your server, gamer nemo_the_retard no clip using, hiding under our base and killing my daughter, so i could look ti, but too fast too screenshot. He even answered on my report in chat "i just can change my ip noob"
Please ban, otherwise that here makes no sense. Unfortunately the server is overrun with hackers atm due to the fact that all the staff members (and ANAND in particular) have gone on swiss-vacations [;-)] so they can pretty much get away with what they please. Stix wrote: Unfortunately the server is overrun with hackers atm due to the fact that all the staff members (and ANAND in particular) have gone on swiss-vacations [;-)] so they can pretty much get away with what they please. Yes, is the 3rd I see, but ok, even the allowance to kick someone would help already. I had at project-hinfrei Server, and guess I need just 3 times in a year. But happy for all on at this time, no further damage or mistrust. Ok - we wait, maybe not game so fast again, Celine will decide. Let them have a nice holiday.